The Short Version: Over 7 million people have used an innovative app called Moment to reduce their personal screen time. The app keeps tabs on how often users pick up their phones and how long they scroll and swipe each day. 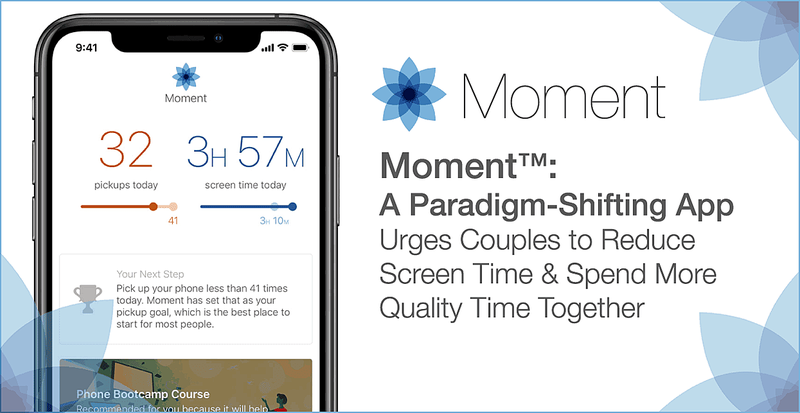 Moment also offers instructive courses and family leaderboards to motivate, educate, and support people as they attempt to disconnect from their phones and reconnect with their loved ones. Moment is currently available on iTunes and will soon launch on Google Play. Yes, it certainly does. Twenty years ago, a phone was something you used to talk to someone. Now a phone has become so much more than that. Smartphones are integral to everything we do (from looking up directions to finding out how old that one actor is), and its high-speed technology has made our lives easier in countless ways. But it can also steal our attention and hamper our relationships. 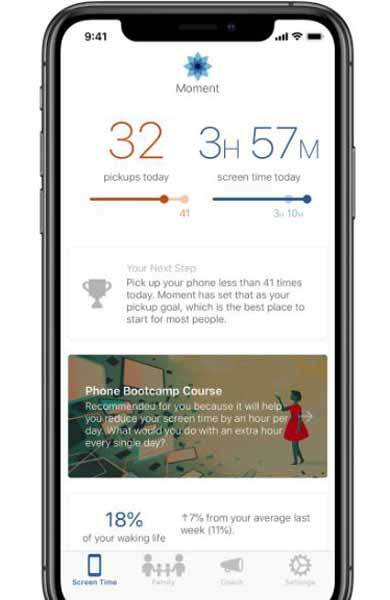 The Moment app is a virtual boot camp that advocates for decreasing personal screen time. Sometimes people become so addicted to their phones that they forget to look up and engage with the people around them. They neglect IRL friends and family members because they’re busy chasing likes, crushing candies, and looking up exes on social media. A groundbreaking app called Moment is on a mission to change those bad habits by educating people about how often they use their phones. The app keeps tabs on how many times you pick up your phone and how much screen time you log in a day. Over 7 million users have downloaded Moment and taken up the challenge to put their phones away and carve out more time for their friends and family members. Moment is available on iTunes for free. Android users can sign up here to be the first to know when Moment launches on Google Play. Smartphone addiction has become increasingly common in modern society. Psychology Today estimated that about 40% of Americans suffer from nomophobia, or the fear of being without a smartphone. I can certainly relate to that. I’m always scrolling, swiping, posting, and playing on my phone in my free time. Whenever a notification buzzes or a call comes in, my hand automatically jerks to answer it. One study found that the typical smartphone user touches his or her phone 2,617 times a day. The highest-frequency users pick up their phones over 5,400 times a day. According to a Badoo survey, the average single millennial spends about 10 hours a week on dating apps alone. They log in these apps around 10 times a day. All that action doesn’t always lead to satisfaction, though — and many young people are looking for a way to curb their habits and re-engage with the real world. In fact, a majority of Moment’s 7 million users are relatively young — 60% of users are between 15 and 30 years old. Many Moment users have spent most (if not all) of their lives in the post-internet world, and they see the value of stepping away from it for an hour, a day, or a romantic weekend. Moment provides a daily, weekly, and monthly summary of your phone usage. Moment offers a path to decreasing screen time and focusing more on offline relationships than online activities. 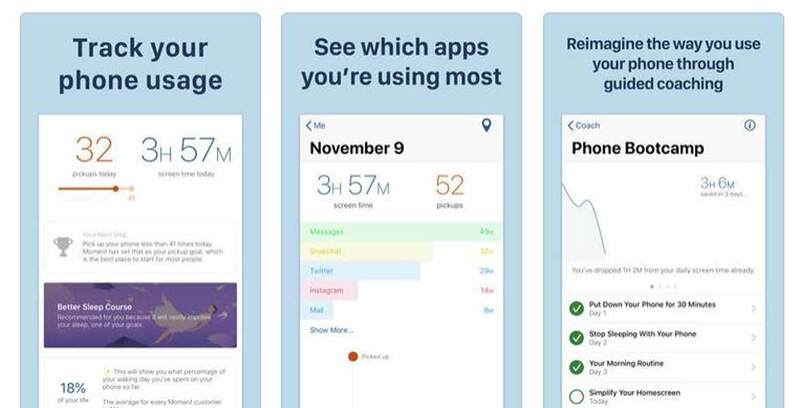 Its screen time tracker lets users know how often they pick up their phone, how much time they spend on their phone, and which apps they use most often. That knowledge can sometimes be surprising or disconcerting (I dread to think how long I spend on my Facebook newsfeed), but it can also spur people to take action and break their bad habits. 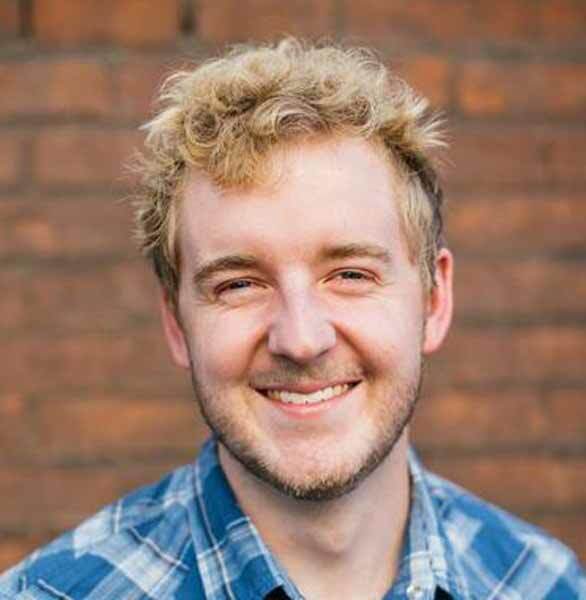 Kevin Holesh started tracking his own phone habits to improve the quality of his relationships. Kevin developed a way to track his screen time and found out he was spending an average of three hours a day on his phone. That number shocked him and solidified his commitment to making a change. He and his wife have worked on putting their phones down during their evenings together, and their relationship has benefited as a result. Now Kevin hopes to bring those lessons to couples, individuals, and families everywhere. He has already developed a comprehensive tracking system to identify the problem, and now he is interested in expanding coaching tools to help solve the problem. He told us expanding Moment’s educational reach is his top priority right now. The Moment team is giving some TLC to the coaching section and adding instructive courses to support users on their journey to more fruitful and less tech-reliant lives. Moment will release four courses in the next few months. One of the courses will focus on tracking sleep patterns and raising awareness about how phone usage can lessen the length and quality of your sleep. With every new educational feature, Moment encourages users to cut ties with the technological world every so often so they can truly live in the moment. The educational content on Moment motivates users to set their phones aside. Smartphone addiction isn’t something that only affects one generation or age demographic. It’s universal in tech-savvy families throughout the world. Moment can appeal to these families with its Family Leaderboard, a collective graph that holds individuals accountable for their smartphone usage. Parents aren’t the only ones interested in sharing the app with their families. Some children have also seen the benefits of unplugging. One 15-year-old girl downloaded Moment and set up a family account to motivate her parents to put down their phones when they were home together. Moment is learning right alongside its users and using its ever-growing wealth of data to figure out how they can change smartphone habits and increase users’ personal satisfaction. A 1998 cellphone isn’t remotely similar to a cellphone today. My first cell couldn’t even take pictures, and I often forgot to keep it with me. Now, my phone is never out of arm’s reach, and I rely on it for everything. It wakes me up in the morning, and it tallies up my exercise goals at night. I’d sooner leave the house without shoes on than without my phone. When I’m not on my phone, I sometimes feel as if I’m missing out on something. But, in reality, the opposite should be true. Being on your phone causes you to miss out on real life and the people in the room beside you. That revelation led Kevin to develop an app to show people how smartphone usage can steal precious hours of their lives. Moment uses statistical data and psychological insights to help couples, families, and individuals decrease their daily screen time. The app’s team advocate for setting your smartphone aside so that you sleep better, love better, and live better.